Like many, you may have a favorite tree on your property that no longer seems to be thriving. Unfortunately, like all living things trees die. While some trees may live for more than 3000 years, many trees live less than 100 years depending on the species type. We’ve put together a few tips to help determine whether your favorite green friend is on the decline or already gone. It’s good practice to do a quick inspection your trees every couple of months. Taking a more proactive approach to tree health and save you some headaches down the road. Be on the lookout for trees that drop leaves in the spring or summer. Yellow leaves can also be an indication that your tree has a health issue. If the leaves are brown and dry in season when normally green and soft you likely have a problem. Evergreens that are prominent in our region will begin to have brown or reddish pine needles when they are in distress or dying. Roots can become discolored, soft, and slippery when your tree is sick or dying. If roots are above grounds and appear to be breaking you may want to have your local tree arborist inspect them. Be aware of trees that suddenly begin leaning slightly to one side. If you see a tree that is growing small branches at the base of the trunk it is usually a sign of illness. The tree trunk is good place to start when it comes to accessing tree health on your property. Missing tree bark on the trunk is a not a good sign and generally the result of disease or insect infestation. Cracks on the trunk are another indicator of overall tree health. Fungus or holes on the trunk are another sign of decay and disease. 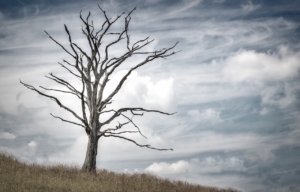 Besides the obvious signs of poor tree health like branches falling off, trees with branches that are losing, or missing bark are either sick or dying. it’s also important to take note of trees with branches that have holes or fungus on them. Tree with holes can often be a sign of insect infestation and these invasions often occur when a tree is on the way out. Fungus on trees is another sign of poor tree health. Fungus typically thrives on dead or dying branches and a good indicator that a part of the tree is dead or dying. Don’t wait to diagnose trees that pose potential damage to your home. Sharp Tree Services takes pride in the proper diagnosis and treatment of your trees. Give us a call to schedule an appointment to avoid the trouble of letting an unhealthy tree get out of hand.